On the 1St of July, was held the first UnivEarthS Labex brainstorming at APC laboratory. This informal meeting, open to everybody, aimed to identify new ideas to develop for calls for projects (H2020, CNRS…) while promoting interdisciplinarity. Stavros KATSANEVAS, UnivEarthS co director, launched the meeting by reminding that participants were free to comment on the presentations and highlighted the importance of discussions following the interventions. For this first meeting, six scientists have submitted ideas and constructive exchanges followed their presentation with the twenty present people. For each one of them, you will find a link to their PDF presentation. 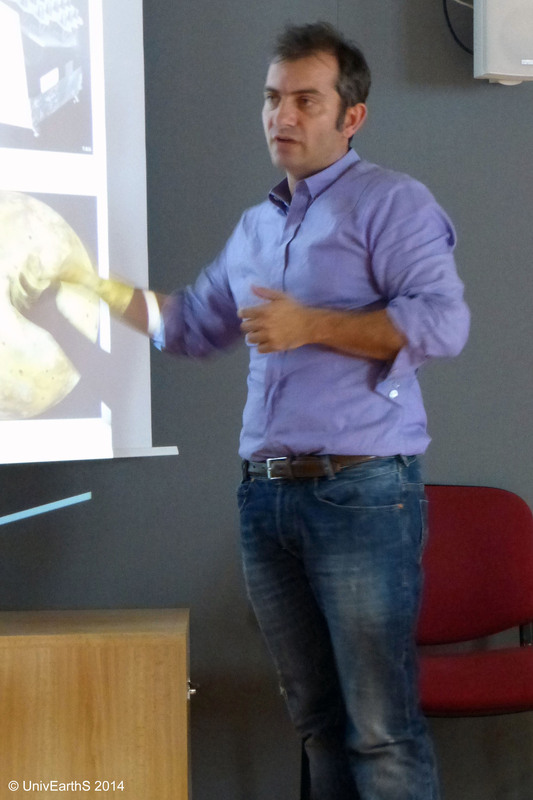 Antoine KOUCHNER from APC presented the possible synergies between the underwater observatories and Earth Sciences. He mainly developed ideas from the community of neutrino telescopes. During the discussion, it appeared that IPGP could be interested in these tomography data, especially information on the core. Thereafter, Antoine KOUCHNER established direct contacts with IPGP’s specialists, including James BADRO and Edward KAMINSKI which focuse on Uranium/Thorium and Potassium concentrations in the deep mantle. 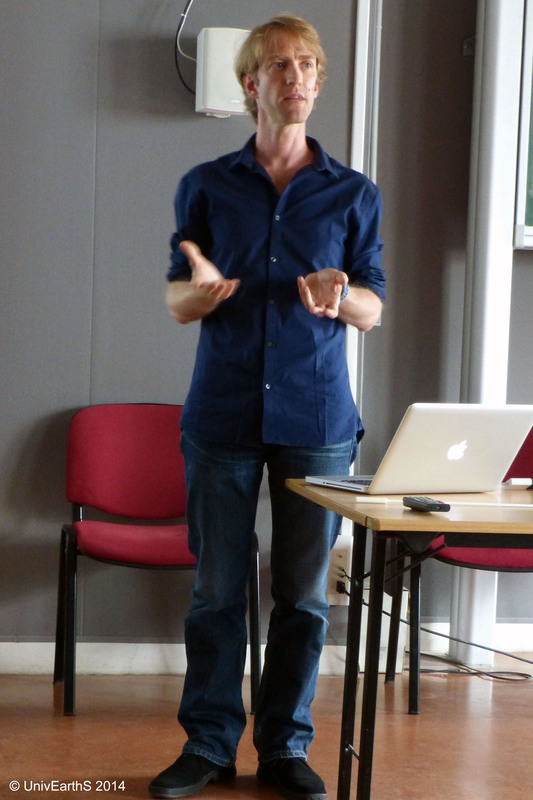 Éric SAVIN from ONERA presented the influence of anisotropy on the high-frequency waves. He developed the connections problems between engineering polycrystalline materials and basic geophysical. This experience, he considers very constructive, was an opportunity for him to establish scientific relations with these communities to develop a project around the ultrasonic imaging for global seismology: the aim would be to enhance the IPGP’s anisotropic models with ONERA’s theoretical data. 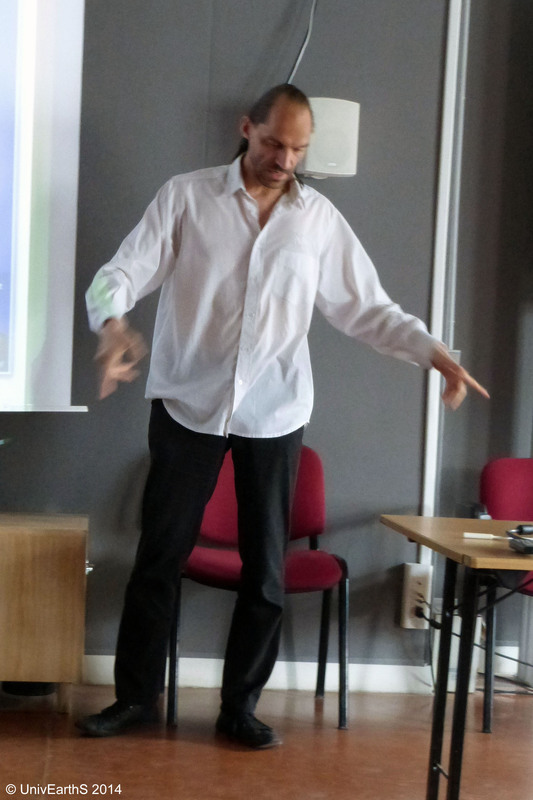 For Étienne PARIZOT from APC, the UnivEarthS brainstorming was very welcome because he is convinced of synergies possibilities between experiments motivated by astrophysics and issues within science of the ocean, the atmosphere and meteorites. He submitted that the JEM-EUSO instrument developed for the study of cosmic rays ultra-high-energy (in the heart of astroparticle physics), will have unprecedented features potentially interesting for geosciences. This meeting has been successful because one of the participants was enthusiastic about the project and further discussions will take place in September in order to truly explore its possibilities. 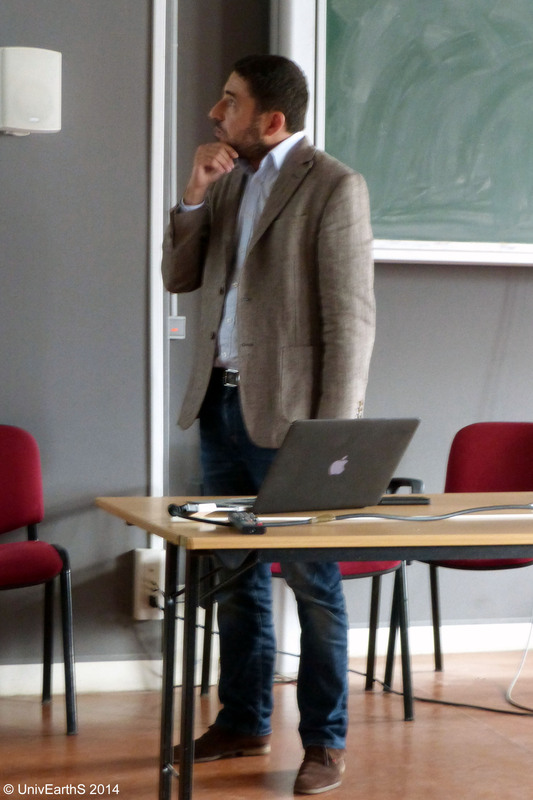 Sébastien CHARNOZ from AIM explained his project “Moons and Exolunes: origin and diagnosis.” He particularly insisted on its originality witch corresponding to UnivEarthS‘s thematic, highlighting a very good international position of Labex multi disciplinary teams. However, he regretted that funding opportunities were not more addressed. 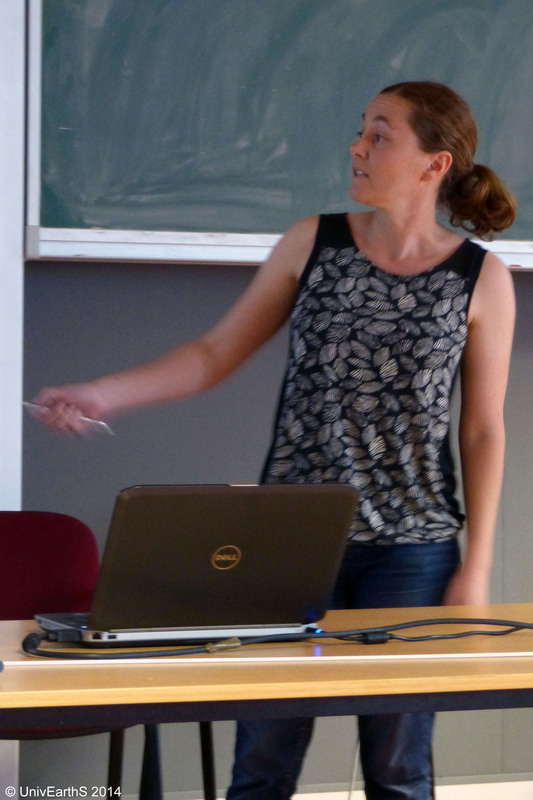 Jaime DAWSON from APC presented her idea for a better geoneutrino detector. For her, this meeting was an opportunity to learn more about geoneutrinos and to know geologists’s opinion on the usefulness of sensors with angular resolution. It is this last point that she has widely developed during her speech. She described a new detection method that could accurately measure the direction of geoneutrinos. 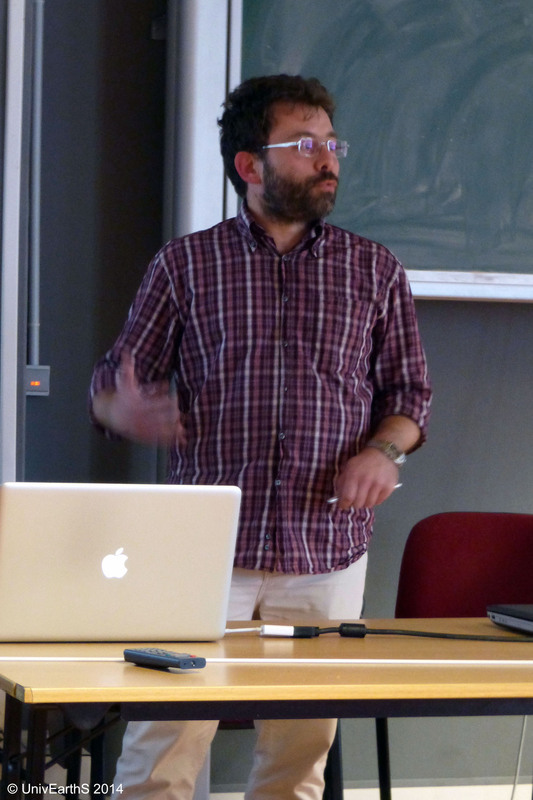 By the end, Andrea TARTARI from APC presented the idea that is being developed in the observational cosmology field: “Microwave and Millimeter Wave Spectro-Photometry Cosmic Microwave Background to target Spectral Distortion.” He wanted a critical review of the project and to share it with other researchers, he could do so during the discussions that followed the presentation, he deemed relevant and constructive. Following these positive returns, other meetings will be organized by the UnivEarthS Labex hoping to mobilize more Earth Sciences researchers. In conclusion, this brainstorming was very interesting and helped bring together scientists from different disciplines to create a synergy around innovative projects.